Terry Cites ‘Factors’ Faced In Establishing I-B Closing Date By SGT. ED ALEXANDER Roundup Staff Writer There is no point in raising false optimism by setting dates for the final closing of the India-Burma Theater, because the close-out depends on several imponderable factors over which Theater officials have no control, said Maj. Gen. Thomas A. Terry this week when asked to comment on the recent Washington statement by Mr. Robert Patterson, Secretary of War. In an exclusive interview with Roundup, the Commanding General of the India-Burma Theater emphasized that chief among these imponderable factors is the question of when and if governments of the United States and India will reach final agreement on the sale and purchase of American surplus property and the speed with which the Indian government will take over the property. Gen. Terry told me he would be ready to close the Theater in a short time, if he were to be informed that agreement on the sale had been reached between the two governments. But, he stated emphatically, until the sale agreement is concluded, it remains the responsibility of the Army to maintain custodianship over the property and to effect the final transfer, when the decision is made. Meanwhile, he stated, the negotiations must go on between the two governments, and Army Theater Headquarters has no control over this factor. Such negotiations, the General pointed out, are involved affairs, in which each government must strive to achieve sale terms which will be satisfactory to its own people. The CG stated the possibility could not be completely excluded that out government and India might not even reach a sale agreement, in which case, completely new plans for disposal of the property might have to be put into operation. Therefore, he summed up, it is as yet impossible to set dates, and to do so would only arouse false optimism. I asked Gen. Terry, "Why is it necessary for the Army to maintain custodial responsibility for the property? Could FLC take care of the property while sale agreement is pending?" The General replied that this duty is required of the Army by Act of Congress. Regulation Eight of the Surplus Property Act of November, 1944, provides that the Army shall maintain custodial responsibility for property to be declared to FLC, spokesmen for that organization told the Roundup in New Delhi. Gen. Terry further explained that the FLC is an organization much in the nature of a sales agency. It could not possibly have the facilities to maintain and transfer the property, he sated. He pointed out that much Army surplus is of a highly technical nature, citing Air Force technical supplies, medical supplies and signal equipment as examples. The General claimed that sufficient trained Indian civilian personnel could not be found to do the entire job; that the work required Army personnel long familiar with the property through training and usage. The white-haired Theater chief outlined several more "imponderable factors" over which the Theater had no control which were bars to setting reliable dates for Theater clearance. ATC must be maintained until commercial airlines take over operation; the theater must await War Department orders as to final disposition of American war dead; communications and inter-governmental contacts in many areas of Southeast Asia must be maintained by the Army, until the State Department is able to resume these jobs, the General said. As soon as the Army in this Theater gets the go-ahead signal from the U.S. government that agreement has been reached on the sale of the surplus property, the Theater can be cleared in short order, but until the decisions are made by these higher agencies there can be no basis for setting dates, the General declared. The Theater doesn't want to make a promise to the men until it is fully ready to back it up with performance, Gen. Terry concluded. NOTE THE BATHING SUIT Clare Poe models a two-piece bra swim suit at the recent "Swim For Health" show in the Hotel Madison at Miami Beach, Fla. The backlog of U.S.-bound mail from the I-B Theater no longer exists, the Theater Postal Officer disclosed this week. Nearly all of the backlog of mail heading for the I-B has been cleared also, with only 1,800 pounds left at Casablanca as of Feb. 5. Early this week the ATC Globester brought in 2,000 pounds of I-B mail. Another mail-carrying plane left Casablanca for Karachi on Monday. However, another plane with mail has been grounded for several days at Cairo with carburetor trouble, but should arrive in India shortly. HASTINGS AIR BASE - Assurance that the present backlog of I-B mail headed Stateside will be cleared this week were made by a Priorities and Traffic spokesman at ATC Headquarters here last week. Returning to the U.S. the bulk of readdressed PCS mail via ship instead of air, a cut in the number of passengers to be flown Stateside, and the reduction of Theater troop strength with a resultant decrease in homeward-bound mail are reasons cited for clearing the backlog of mail at Casablanca accumulated during January. Despite the cut in air service from one plane every hour to one flight every other day from Karachi, no future backlogs are expected. The end of stormy winter weather is near and regular air shipping will be adequate for moving future Theater mail allocations set at an 800-pound daily average, explained the ATC spokesman. There has been a five-day backlog in India-bound mail at Casablanca, contrary to last week's Roundup story, the spokesman said. However, this situation will be cleared shortly. I-B postal and ATC authorities have not been napping. This backlog of mail was called to the attention of North African ATC headquarters at Casablanca and Theater headquarters has notified the War Department in Washington, he said. A full knowledge of the procedure in handling I-B mail will clear many misunderstandings. Air flights to the U.S. from Karachi operate under a "channel allocation" system. Passengers and mail are proportionately divided by the Middle East and Mediterranean Theaters, Casablanca area and this Theater. Only one C-54 transport plane is scheduled to leave Casablanca for the U.S. each day. This single plane must carry mail from all these theaters. The planes leaving Karachi to Casablanca turn around there and return, and do not continue on to the U.S. Therefore, if stormy weather on the North Atlantic grounds the daily flight from Casablanca to the U.S., an inevitable backlog begins to accumulate as mail pours off the daily flights from the AMET and I-B Theaters into Casablanca. The only method to clear this backlog at Casablanca is to request more planes from the U.S. or, if the emergency prevails for a long period of time, have ships from that area stop at Casablanca to transport home the mail. Bad North Atlantic weather in turn creates a mail backlog in the U.S. and can only be cleared in a similar manner. ATC's pipeline of C-54's declared surplus and returning to the States at a rate of one a day until Feb. 7 has been a tremendous aid in clearing the present backlog, it was explained. However, these pipeline flights are somewhat slower in returning to the U.S. as their route is from Casablanca to Brazil to Miami, instead of the regular Azores to Bermuda to New York course. WASHINGTON - (UP) - Secretary of War Robert P. Patterson last week said he hoped American forces could completely evacuate some minor overseas theaters in the next few months. Returning from his around-the-world inspection trip, Patterson told reporters at a press conference that evacuation studies now are underway in the India-Burma Theater, the Middle East and North Africa. He added these evacuations would not substantially reduce the Army's manpower requirements estimated at 1,500,000 by next June 30. He said, however, that after June 30 a slow and steady decrease in Army strength could be expected as various Army obligations ended overseas. He vigorously defended the Army's demobilization record. "Since Pearl Harbor 10,600,000 have served in the Army," he said. "Last may the strength was 8,300,000. By next June we will have returned 7,750,000 men of the latter to civilian life." He said that the estimates of Army leaders of a need for 1,500,000 men by next June 30 was based on the closest calculations. He said the forces in the Pacific area under General MacArthur now totaling 875,000 will be reduced to 375,000 by July 1. First Army forces in China, now about 90,000, will be cut to 6,000. The 280,000 men in the Philippines on Jan. 1 will drop to 79,000. Unless revised, plans call for the reduction of India-Burma forces to 4,000 on June 30, Patterson said. Middle East forces likewise will drop from 18,000 last January 1 to 5,000 June 30. In Italy the reduction will be from 51,000 Jan. 1 to 28,000 June 30, if the peace treaty is not signed by then. General Joseph T. McNarney is to reduce occupation forces in Germany from 622,000 Jan.1 to 307,000 by the end of June. When asked by Roundup to comment on the fact that last week the quota for G.I. 's to be homeward bound between Jan. 21 and Feb. 7 had been cut by 2,006 from earlier estimates, Theater spokesmen explained that the Gen. Hodges, originally slated to hit Calcutta on Feb. 12, has been delayed until Feb. 27. Rather than bring the men to Kanchrapara and have them wait around the extra time, the spokesman replied, it was considered better to delay their arrival at the Replacement Depot. 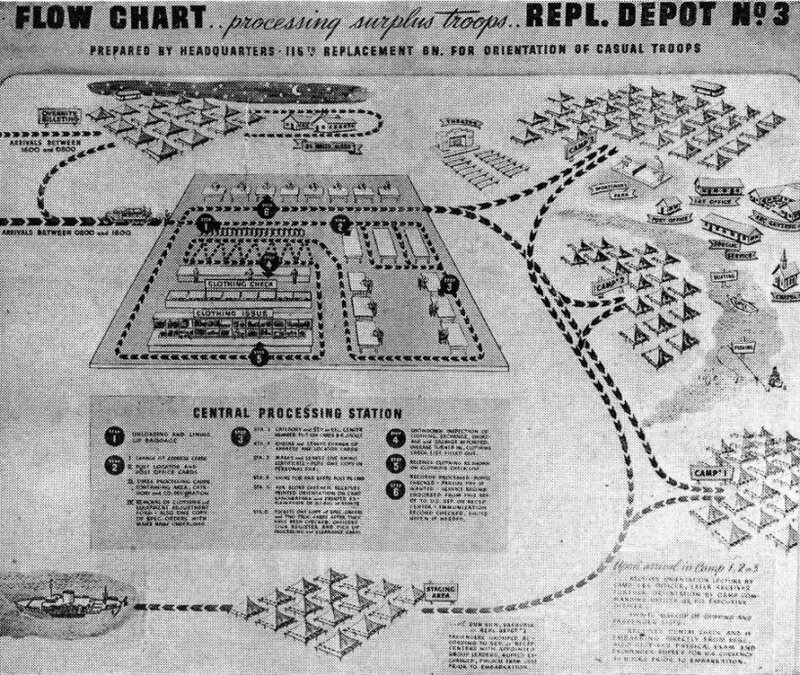 It is now expected by Theater headquarters that all personnel moved to Kanchrapara Depot for return to the U.S. within the quotas set for the Jan. 21 - Feb. 7 period will be able to ship from Calcutta by Feb. 16. IS THERE ROOM FOR ONE MORE? The girls' swimming team of Barton, Fla., is shown in the famous setting of Cypress Gardens as they sunned themselves between workouts in preparation for a recent competition. three weeks except when extraordinary ship delays occur, like the one which recently held up the departure of about 5,300 50-point men. All troops ships sailing during February from Calcutta will land G.I. 's in Seattle, as heretofore. Although four of the ships will leave the U.S. from New York, and one will depart from San Francisco, the previous practice of disembarking I-B homeward bound men in Seattle will continue this month, the spokesman announced. The arrival times in Calcutta of the Gen. Hase, Gen. Bailou and Gen. Hodges have now been pushed back one day later than announced last week, while the Gen. Collins will be two days later than previously stated, according to Theater transportation authorities. CALCUTTA - Two officers were killed and one was seriously injured when a C-47 plane crashed and burned after takeoff at 7:12 a.m., Jan. 29, at Barrackpore. 1st Lt. George A. Carpenter of New Orleans, the pilot, and Maj. Phillip J. Burnett, of Brookline, Mass., the lone passenger, were killed. 2nd Lt. Daniel E. Bowers of Cordele, Ga., the co-pilot, was seriously injured and burned. Burnett, a member of the Army Exchange Service, is survived by his wife and son, Bobby, whom he had never seen. CHUNGKING - (UP) - China headed down the road toward unity and democracy this week with parties to 18 years of civil strife pledged to support a new national program of peaceful national reconstruction. The new common platform, agreed to by the Political Consultative Committee, directed unification under leadership of Generalissimo Chiang Kai-shek following the principles of Dr. Sun Yat-Sen, father of the Chinese Republic. Chiang told the PCC unity delegates they had accomplished what had been intended and he hoped "the harmony would live forever." "From now on," Chiang said, "the heavy task of rebuilding the nation rests not on the Kuomintang alone, and much less on me as an individual. This tremendous burden will have to be borne by all." "The Theater maximum" of morale-building facilities is now available "to every man remaining and if advantage is taken of everything now provided, no soldier can find excuse for spare time on his hands," says Col. Donald A. Young, Theater Morale and Leadership Officer, in a recent report on morale to the Commanding General. The report concludes: "It is not believed that any action ... other than the continuation of the present intensive morale program, the flow of pertinent information to the field, and periodic inspections and checks, is necessary." Col. Young made his report as a result of a letter from the War Department to commanding generals of all theaters in which the Department states in part, "On his return from his recent extensive trip overseas, the Assistant Secretary of War reported that one of the chief impressions he obtained was one connected with manpower and personnel, or stated differently, morale. As a result of his contact with troops, he was convinced that one of the most immediate problems facing all commanders was that of preserving a healthy attitude among the troops, both for the sake of the job to be done on the ground, and for the effect that it might have on our future defense systems after the demobilization period is over." 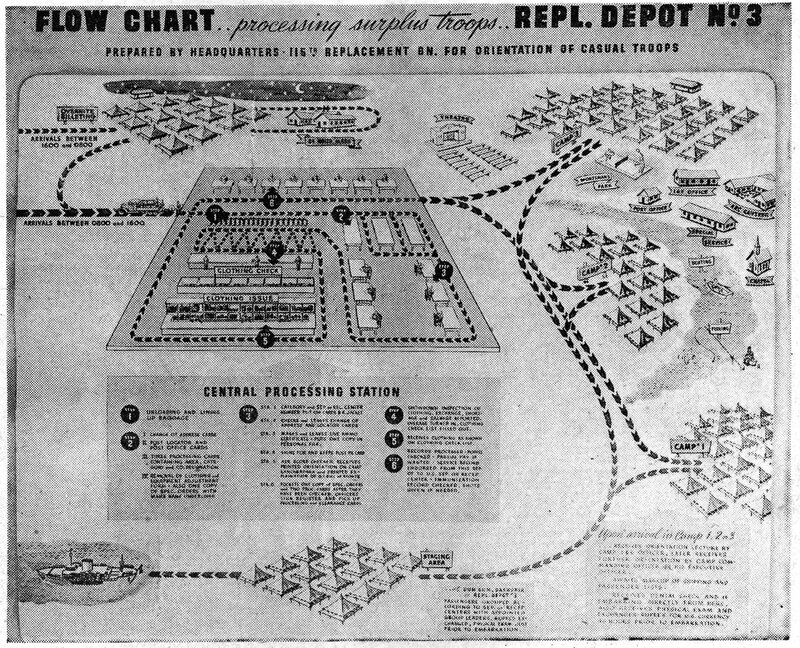 Col. Young's report cited the fact that units and detachments in the most isolated areas had access to the same welfare and morale improving features as were furnished to rear areas. He stated that recently more emphasis on morale building efforts was placed on concentrations of troops at the staging areas and bases. GALAXY OF STARS AT DELHI MEET Lt. Gen. Robert L. Eichelberger (left) Chief of U.S. Army Ground Forces in Japan, stopped overnight in New Delhi last week on his way back to Tokyo after a furlough at home. 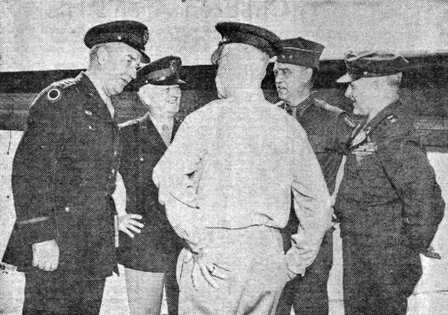 Maj. Gen. Thomas A. Terry (second from left) I-B Theater Commander, Maj. Gen. Donald H. Connolly (back to camera) U.S. Deputy Foreign Liquidation Commissioner, and Maj. Gen. Vernon Evans, I-B Theater Chief of Staff, were on hand to welcome him at the airport. Maj. Gen. Hugh J. Casey (right) Chief Engineer in Japan, accompanied Eichelberger. principal features of the morale program. He enumerated the Press, Roundup, and Armed Forces Radio Service as the media through which a constant flow of authoritative information from Theater Headquarters has gone to troops in the field to "augment and clarify directives." Col. Young's report said that the theater education program has far exceeded expectations. "A review of morale and welfare activities at this date ... indicates a maximum use of the facilities provided and a general understanding by the soldiers of this Theater of the evacuation program and the attendant deactivating job remaining," the report stated. It continued, "The even flow of troops to the ports and the steady evacuation of the high point soldiers has disapproved undue fears of many concerning a possible long term in India." "There is, on the part of those still in the Theater, an understandable desire to go home at once, but the facts regarding the closing job and the available transportation have been given to all and reiterated to the extent that the logic of the lowest point men closing out the remaining installations is understandable to all," Col. Young continued. Col. Young, a cavalry officer, has 29 years' experience as an officer in the Regular Army. HONOLULU - (UP) - W. H. Donald, the famous "Donald of China" and advisor to Chinese governments for nearly 45 years, said last week that America's Far Eastern policy is "playing into the hands of Chinese Communists." Donald, 70, and critically ill at Alea naval Hospital, told reporters in a sick-bed interview that the "Communist government at Yenan hoped Washington would do exactly what it has done - choke off material and financial aid to Chungking." He said that "Chinese Communists live off the land and since they have never been the recipients of aid from anyone, including Soviet Russia, their position is unaffected. Since they have no intention of laying down their arms, their strength may grow purely because the area under Kuomintang administration will be weaker." Donald said that many writers, especially Americans, "have been taken in" by Communist advances after a "Cook's Tour" of Communist-held areas. "None of them saw the danger to Asia," Donald explained, "that a solid Communist front from Moscow eastward and south to India would mean." Meanwhile U.S. Army headquarters in Shanghai announced that 300,000 Japanese have been repatriated from the China Theater. The Chinese are using six Liberty ships in the movement of government troops to Manchuria, leaving only LSTs for repatriation work. It was emphasized that U.S. forces are not aiding in troop movements to Manchuria, except for transporting the New Sixth Army to Hulatao and Chingwangtao. This is part of the staff which once operated VU2ZN at Ledo. Left to right are S/Sgt. George Gingell, Lt. L. M. George and T/3 Walter Flint, all three now at VU2ZY in New Delhi, and S/Sgt. Bob Spiros, now en route to the U.S. The great pulse of the Ledo Road has slowed down. The thousands of men and machines that manned the incredible supply line to China have gone. The pipeline is no more and the jungle is fast creeping in along the way that once swarmed with platoons, companies and battalions of Service Troops. Among the landmarks to disappear in the wake of departing men were the Armed Forces Radio Stations. 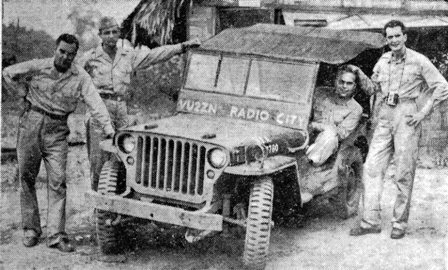 Since 1944, troops along the road had been provided with Stateside radio entertainment by a chain of broadcasting stations known as the India-Burma Network. Men in Chabua, Shingbwiyang, Myitkyina, Ledo and Bhamo were entertained from early morning until late night by the finest radio programs in the world. Top stars from radio, stage and screen shared the AFRS spotlight with prominent figures from every walk of life. Actors, singers, orchestras, comedians, statesmen, scientists, authors, all were part of one of the most widespread military morale building programs ever created. First of these stations to open in the Ledo Road area was at Chabua, in northern Assam Province. Next came Shingbwiyang in Burma in August, 1944. In December stations in Myitkyina and Ledo opened up. And in February, 1945, while combat missions still were being flown from the Bhamo airstrip, another Armed Forces Radio Station went "on the air." These stations covered all the outposts that worked and rode the Ledo Road. The story behind each of the stations is much the same. Weather conditions made the maintenance of equipment almost impossible. Fungus and mold crept into intricate machinery overnight; dampness rusted and rotted as fast as new parts were replaced. Still, somehow, through the inevitable ingenuity of G.I. 's the stations kept on the air. The difficulties of procurement provided another stumbling block to decent operation. The "world's longest supply line" found little space for radio parts. The majority of the AFRS trained soldiers who manned the stations were former radio and entertainment professionals. At Chabua, under the guidance of Maj. Frank Goss and T/Sgt. Pat Bishop - both former Hollywood news announcers - were T/4 Gene Sayet and T/4 Fergus Steven, in Myitkyina were S/Sgt. Dave Page, T/4 Howard Williams, T/4 Will Jackson and radio, Stage and Screen actor Sgt. Jimmy McCallion. Lt. John Bennett of San Francisco Radio was officer in charge. The Ledo Station had five ex-radio men" S/Sgt. Jerry Sears from WATL, Atlanta; S/Sgt. Bob Spiros of WLW, Cincinnati; T/3 Walter Flint from WQXR, New York; S/Sgt. George Gingell, radio man with Sammy Kaye; and Lt. L. M. George from Cache Valley Broadcasting Company in Utah. Bhamo boasts of T/Sgt. Les Damon, Chicago and New York radio actor, who created the title role of "The Thin Man," one of radio's most popular mystery series. There's hardly a soldier in China, India or Burma who has not tuned in on one of the AFRS stations scattered throughout the Theater. Beside the Ledo Road operations, there are at least a dozen others, including Calcutta, New Delhi, Karachi, Agra, Kunming and Chungking. The programs that are broadcast represent the finest entertainment available. The shows are transcribed in Hollywood and shipped by ATC to all parts of the globe, every week. Most of them are "off the air" recordings of Stateside broadcasts, with the commercial announcements deleted. However, shows like Command Performance, Mail Call, GI Journal, Jubilee and GI Jill are written and produced exclusively for servicemen overseas. Supplementing the transcribed shows, most of the stations have presented all kinds of local talent in their studios. In Ledo, for example, there were no less than fourteen "in-person" shows per week during the days when Ledo was the bustling "zero" mark of the road. There were bands, quartets, soloists, choruses, hillbillies, speakers, plays, religious services, newscasts, interviews with important personalities and the ever popular record request shows. An there were remote broadcasts that covered everything from a visit to a G.I. Pig Farm to dances at enlisted men's clubs. The Bhamo station will go down in history for its famous baseball broadcast. The announcer was Kelly. He was also one of the players, describing every minute of the game, even while he was up at bat and running bases. The G.I. 's who listened to Armed Forces Radio may never recall the work and struggle that went into bringing radio entertainment into the jungle outposts of the Ledo Road. However, we doubt if they will ever forget that through the miracle of radio, Bob Hope, Bing Crosby, Joan Davis, Roy Acuff, Frank Sinatra and hundreds of other great names in show business helped them to forget the heat and the monsoons and to bring China, Burma and India just a little closer to home. You may think somebody is all wet, but the monsoons are here, and, what is more, they have been sweeping over most of India and Burma through weeks and weeks of ideal sunshine. Want to bet five rupees? Go to the nearest United States Army weather station! 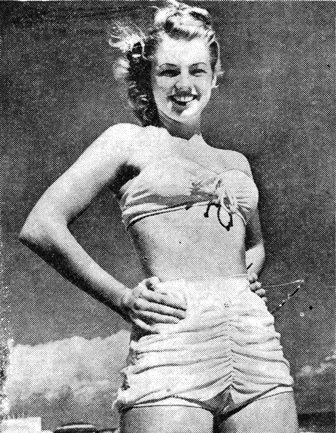 DECORATED SUIT Among the more unusual bathing suits photographed on Hollywood cuties is this number, worn by Barbara Hale, and decorated with coins sent her by servicemen from all parts of this world. A word though, before you dash away: The present monsoons are known to Army weather station observers as the "dry monsoons" and are little more than winds flowing southeasterly across India to low pressure areas over the sea. When the opposite flow occurs, India and Burma drip under the "wet monsoons." The men and officers of the Army's 10th Weather Region, which includes China, India and Burma, now operate nine weather stations scattered over the I-B Theater. They keep close tab on the monsoons - both wet and dry - while recording every impulse of the elements here. Lives of American pilots, crews and passengers depend on their findings. Every hour, night and day, these Army weather observers take readings to determine, literally, just what's in the air. Reams of significant data are placed on charts, diagrams and maps. Hourly readings record sky conditions, visibility, weather and/or obstructions to vision, sea level pressure, temperature and dew point, wind direction and velocity, and altimeter reading. Barometer tendency is recorded every three hours. Precipitation, maximum temperature, minimum temperature and relative humidity are checked every six hours. Then weather findings are interchanged with other stations. Army weather stations throughout India and Burma are located at Barrackpore, New Delhi, Panagarh, Lalmanirhat, Gaya, Agra, Nagpur, Karachi and Chabua. Information at these stations is augmented by weather reports from China, Russia, Arabia, Iraq, North Africa and all RAF and Indian civilian weather observatories. Headquarters Detachment of the 10th Weather Region is at Barrackpore, with Capt. Joseph Novello in charge. India-Burma weather stations function under command of AAF Weather Service, Headquarters at Langley Field, Va.
Army weather men say the "wet monsoon" season - officially due to start about June 6 - will be preceded by a two-month preliminary of changeable weather, accompanied at times by violent thunderstorms and winds. The "wet monsoons" will spread northwest across Burma and India like a huge blanket, the weathermen say. The edge will strike Rangoon, Calcutta, Agra-Delhi and Karachi areas in that order, then gradually recede. The "wet monsoons" will be officially ended by Oct. 6. The fact that land is heated and cooled more rapidly than large bodies of water creates low pressure areas over land masses in summer and over ocean areas in winter . . . thus the monsoons. They are seasonal reversals in wind directions, which actually occur in less marked degree over all continents. Lt. James M. Brown, one of the weather officers, points out on his charts that humidity seldom drops below 85 percent during the "wet monsoons" in the I-B Theater's "sticky-belt" - pivoted on Rangoon and Calcutta. When it comes to knowledge of Indian colleges and especially Indian girl collegians, the American G.I. 's education has been sadly neglected. So on behalf of inquisitive G.I. 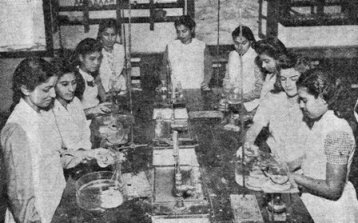 's, Roundup this week invaded Lady Irwin College - a veritable Vassar of the Orient, a remarkable all-girl school at New Delhi under an able, up-to-date directress, Mrs. Hannah Sen. The students are Hindus, Muslims, Christians and young women of all other faiths. They come from Calcutta, Mysore, Benares, Agra, Allahabad, Madras and cities representing every province in India, not to mention several Indian States. They live and work together without social, racial, religious or caste discrimination - the poor, attending school on one of the 20 or more scholarships awarded annually, or the independently wealthy. They wear saris or western dresses, long or bobbed hair. Mrs. Sen does not tolerate intolerance. Lady Irwin College can not begin to accommodate all its applicants. School enrollment is 240. This term almost 400 girls applied for admittance, including two from Burma. Graduates are in constant demand as teachers. 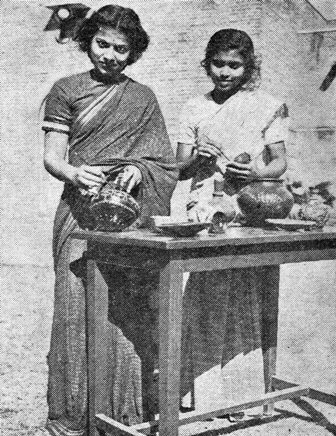 The college debating team in 1945 captured the Challenge Trophy, symbolic of supremacy over India's best collegiate debaters - both male and female. Athlete's at the school repeatedly have dominated the Girls' Annual Olympic competition in India. Last year they won every event except the javelin throw. The previous year they made a clean sweep. The G.I. who knows "Betty" of Wellesley, "Marge" of Stephens or "Mary Jane" of Bryn Mawr would suffer no letdown in meeting, say, Usha of Lady Irwin College. Usha Khanne, an ideal example of modern Indian college girl, was selected for a Roundup interview. This comely Hindu girl from Peshawar in the Northwest Frontier Province, can discuss Robert Browning's poetry, Russia's home policies, Pulitzer Prize winners and complex chemical formulas. She can perform a variety of western and oriental dances, can play the piano - and a good game of softball! A graduate of Punjab University at Lahore and taking special schooling at Lady Irwin College, Usha has been active in dramatics, playing the leading feminine roles in Barrie's "Quality Street" and Sheridan's "Rivals." She won honors in history at the university. She teamed with another Lady Irwin student, Gubali Alluwalla, to take the all-India debate title for the school. Opening the interview in best American tradition, with triviata, the G.I. invader from Roundup asked Usha if she had heard of Sinatra and Crosby. "I've heard of Bing Crosby. I've seen him at the cinema." "What do you think of Bing's singing?" "Oh I don't know. I haven't heard enough western music to say." "Yes. I once played piano but I haven't time anymore." Usha explained that she enjoyed dancing, especially modern Indian expressional dancing which had developed in the past 15 years. It was something like ballet, she said. Yes, she could dance western ballroom style but did so only at home among family members. "Do you like the theater?" resumed the interviewer. "I'm interested in dramatics. I like Barrie and Shakespeare." "Are you familiar with the American playwright, O'Neill?" "Yes, I was selected to play in one of Eugene O'Neill's plays." It developed that she had read considerable American literature. "Do you read American magazines?" "Yes, but only since the war. We've been getting Life, Colliers and my favorite, Reader's Digest." "You say you like drama. Ever think of entering Indian movies as a career?" "No, my family wouldn't like it. I want to teach." "Yes, I play softball, tennis, netball and throwball. And I like to swim. It's beautiful for swimming at Kashmir." Netball is, Usha explained, a form of basketball popular among Lady Irwin College girls. Throwball is similar to volleyball. "What position do you play in softball?" "A missionary taught us. The missionary called herself ‘Killer Kelly’ when she played." (Laughter). "Ever hear of Babe Ruth?" Usha laughed again at this. "Yes," she replied. "The missionary told us." Then she asked a question. "Aren't you Americans interested in politics?" We started to explain, but Usha didn't wait to hear it. She launched an easy-flowing tirade against present "American apathy," She spoke of the Constitution, the War of Independence and other achievements in American history. Then the Indian collegians dark brown eyes snapped. Bluntly she asserted she and others of India had lost faith in America. "Americans are not what we supposed they would be! We once looked to them for hope but now we are disappointed!" Back in the school, the students went about the business of studying physics, chemistry, biology, civics, sewing, cookery, laundering and organized calisthenics. One-third of the training is in sciences. Included among the school's modern teaching methods is the educational film, incidentally. A student committee encourages such functions as reading, drawing, painting, instrumental and vocal music, Indian classical dancing, craftwork, shorthand, typing, dramatic productions, debates, spinning, fancy needlework and games. Students print a daily news sheet in three languages - Hindi, Urdu and English. An entrance requirement at Lady Irwin College id knowledge of both Hindustani and English. The school's yearbook is called "Jagrati," which means "awakening." 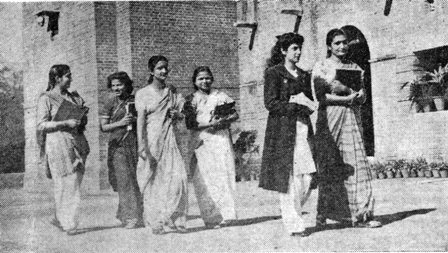 The college girls live in hostels, usually four persons to a room, and take turns spending six weeks at one of the two model brick homes on the campus. In these practice homes the students are taught practical home management. The school's primary purpose is to turn out domestic science instructors. Authorities from the Indian Army recently appealed to the college for help in dietetic fields. WAC(I) officers studied at the school and returned to the Army to teach enlisted personnel the best preparation of nutritive Indian meals. Government nurses from Bombay received special instruction in general nutrition and invalid diets. The college was founded Nov. 10, 1932. It is comprised mostly of low, red brick buildings on a spacious campus beautified by shrubs, petunia and other flower beds, and shade trees. It had been with some apprehension that the G.I. from Roundup entered these grounds. But no sari-clad figures dashed for cover, no resentful faces were turned his way. Cooperation favored every question. He left with complete respect for India's college teachers and girl collegians. House wifery training, it's called, and it keeps two seniors occupied outdoors at the school. At the left is Kuali Bhandari, who hails from Poona. The other collegian is Aleyamma Danial from Travancore. 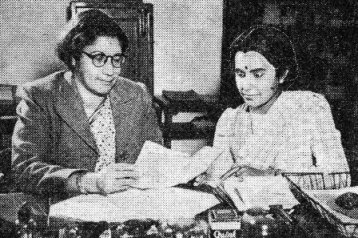 Mrs. Hannah Sen, college directress, checks debate notes with Usha Khanne of Peshawar, Northwest Frontier Province. First year chemistry students conduct experiments in the laboratory. The Roundup is a weekly newspaper of the United States Forces, published by and for the men in Burma and India, from news and pictures supplied by staff members, soldier correspondents, Army News Service and United Press. The Roundup is published Thursday of each week and is printed by The Statesman in New Delhi and Calcutta, India. Editorial matter should be sent directly to T/Sgt. Charles Kellogg, Hq., U.S.F., I.B.T., APO 885, New York, N.Y., and should arrive not later than Saturday in order to be included in that week's issue. Pictures must arrive by Friday and must be negatives or enlargements. Stories should contain full name and organization of sender. Complaints about circulation should be sent directly to Capt. Drexel Nixon, Base Section APO 465, New York, N.Y. Units on the mailing list should make notification of any major change in personnel strength or any change of APO.